Thanksgiving, like Christmas, is a traditional family gathering either at our parents, if we still are fortunate enough to have them, or a sibling or whichever family member does the cooking that year. The holiday conjures up memories of other Thanksgivings and more often than not, there is a big stuffed turkey, with lots of vegetables and trimmings. If you are Italian, or any other nationality, there is sure to be favored ethnic dishes piled high. We try to make sure we have room for the pumpkin, apple and mince pies – what is Thanksgiving without the memories of feasts we’ve shared? We probably all have similar sayings and customs for this “Thank You Day” or “Turkey Day”. I always say something which my mother always said when we sit down at 3:00 pm for dinner, “Do you realize how many people are doing this same thing right now?”…..and most likely my daughter will say it someday when I’m not around in memory and fun. She does so already. After our first blessing, I ask one of the children to say grace. Children love to be part of an adult gathering and they love to say grace. They are thankful for everything, so make sure all the plates are covered against getting cold. The rest of the children want to add their thanks, too, and you get a good idea of what makes these little people the happiest. Anyone who wants to add a prayer, is welcomed. 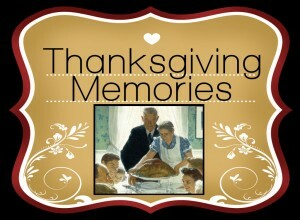 After dinner, we always go round the table and each person tells everyone what they are most thankful for this year. The kids enjoy this part the most. This is always special as some people always joke; some always get very serious; some get emotional; and some articulate beautiful thanks to someone there who especially went the extra mile to help them. This part of the meal – while digesting – and before dessert – is very family-oriented. No hand-held video games, iPods, or cell phones are brought to the table. During dessert, we ask if anyone wants to do the ‘Christmas grab bag gift’ idea. We started this when the family and kids and grand kids started to number 30. Instead of buying small gifts for everybody, we have a grab bag. Everyone’s name goes in the hat and each person picks a name and buys a gift for that person and that person only. We put a price tag on it – one year it was $25.00 and that was a little too much for the teens and kids, so we settled on $15 or $10. What exactly is a hospitalist? The definition of a hospitalist according to the National Association of Inpatient Physicians is stated as: “A physician whose primary professional focus is the general medical care of hospitalized patients”. S(he) can be a D.O. (osteopathic physician) or an M.D. (allopathic physician). Hospitalists may engage in clinical care, teaching, research or leadership in the field of general hospital medicine. They are an emerging role in today’s American health care system. Hospitalists are onsite physicans and work around the clock caring for inpatients – their specialty. Demographics on hospitalists are: Young male and female U.S. medical school graduates (87 %) and are about 40 years of age. They are predominantly male (73%) and 82% of them are trained in internal medicine – as a D.O. (osteopathic physician) or an M.D. (allopathic physician). Since 1996, the number of hospitalists has increased from about 500 to about 15,000, and the number was expected and has increased to about 30,000 in 2010, according to the Society of Hospital Medicine. These physicians provide high-quality medical care from admission to discharge. They can interpret all lab work, specialist exams, and diagnostic tests and test results. They answer questions and ease patients’ concerns and provide the primary physician with detailed reports of their patients’ hospital stays, and recommend follow-up care. Because of their care, a patient’s hospital stay may be shortened, patients receive a greater consistency of attentive care and have more ‘personal’ contact. Here is a Salary.Com Wizard page for hospitalist salaries. Just enter your zip code.